The deets: J.Crew shorts and tee; eBay necklace; Zara heels; Ray-Ban sunnies; ASOS, South Moon Under, and Michael Kors on the wrist; Sally Hansen "Mellow Yello" nails. I know it's not really cool anymore to perfectly match your outfits, it's all about color blocking, pattern mixing, ombre, monotone, making yourself look as crazy unique and decorated as possible, blah blah blah. I realize all of this and have to say, as you guys have probably picked up on by now if you read my blog often, I do it anyway because... IMMA DO WHAT I DANG WELL PLEASE! THAT'S WHY! Have a lovely Thursday, everyone! I love those heels! I'm all for the matching and doing whatever makes you feel good. This is a really cute look :) Happy Thursday!! I say go for the matching! You look fabulous, not to mention I am totally jealous of how perfect your hair looks. How on earth do you keep your hair looking so amazing in this insane humidity? I DEMAND TIPS. Haha people can blog crazy outfits but I bet once the cameras are turned off, its back to their matchy matching outfits! I love this, bc of your blog I must now own some J.crew pieces !! I just had the same nail polish on my nails!!! Love it - and the matching outfit! I love the matching! It's always refreshing to see a blogger do their own thing and not worry about following all the trends. Keep it up, girl! heck yes! do what you wanna do! i love this matching outfit! I love that! Those heels are fabulous! I think matchy-matchy can be a good thing! I love those colorblocked shoes, so cute! Wow. 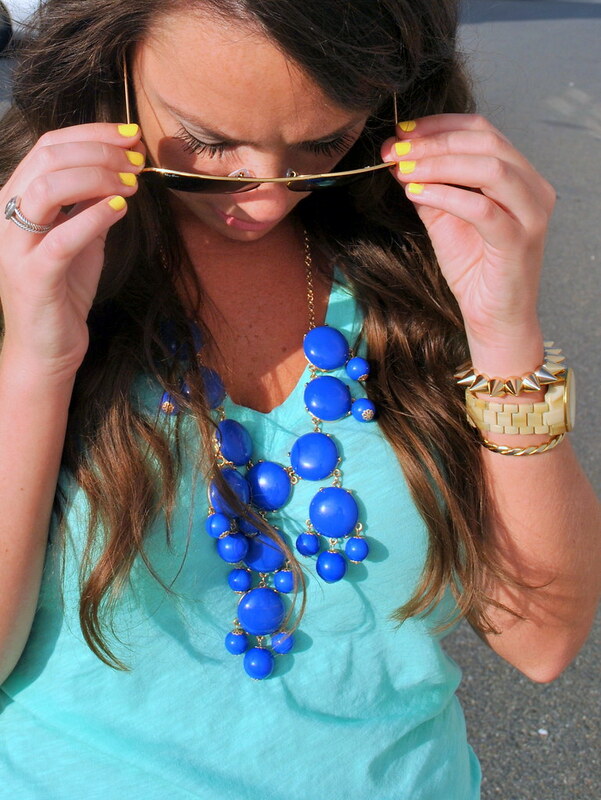 Your heels match to your top and necklace! :) So adorable! Beautiful outfit! Love that you've taken the colours from the shoes and made an outfit out of them - very creative and totally chic <3 Love it! okay seriously, erin? you look AMAZING! love it! Sometimes you just can't help but be matchy matchy. Especially when you have fabulous shoes like those! You look great. Perfect summer outfit. I think it looks great, taking the colors from the shoes and using them in other items in your outfit! It's matchy-matchy in a chic way! I love your T-shirt. I have been in the hunt for some good just plain T-shirts, and its harder then one would thing. I love the matching, looks great on you! Those shoes are just amazing on you. I just love these colors together. I'm obsessed with those shoes! I love matching - always have and always will! I don't feel I'm very good at mixing patterns and colors..probably the perfectionist in me or something! :) Glad to see someone else do matching! I love the blue and teel and the shoes!! You look lovely! I'm having a $75.00 Shabby Apple Giveaway on my blog!! Check it out and enter to win! You are an adorable little sass pot! Love it! Just came across your blog! It's great...I'm a DC blogger too. I love to match and coordinate outfits. Maybe that's not in right now but whatevever. I'll step out of the box sometime. I love matching, and because of that I have a hard time with pattern mixing. You look cute! Love the shades of blue! I'll never stop matching either, it's ingrained in my brain :) Love your hair in these pictures also! I love the colors on this... and definitely almost bought those heels. How are they? Are they comfortable? I do what I want! You go girl! You look hot in this outfit. Keep on wearing what you love. It's why I come to your blog! Aren't you just adorable?! 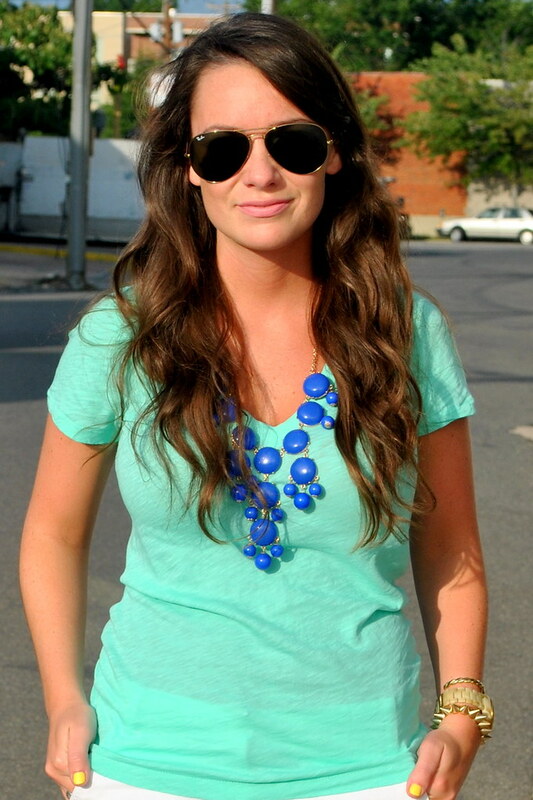 I love that the heels match the shirt and necklace.. match on sister! :) Happy Friday! Check out my Fab Friday Beauty Tip if you get some time today!! pretty hair and i love that cute yellow polish! The yellow nail polish is an awesome touch! Darling outfit! I'm loving those necklaces! I need those sunglasses! Cute outfit!